Those of us in the northern slice of the United States have had to contend with unusually cold weather over the past few weeks, coupled with snow and ice that have reached even the usually mild southeast. My original hometown of Lafayette, Louisiana actually got snow two days ago, and Lafayette is the place that my dad described as being so Deep South that if it were any deeper, we'd have been floating. And almost everyone has heard about the snow storm that paralyzed the city of Atlanta, leaving highways gridlocked, thousands of car accidents from minor to horrifying, and hundreds of students who were stranded at their schools overnight. ... may not have been snow. At least, that's the contention of a variety of conspiracy theorist types who evidently have three scoops of rocky road with extra nuts where the rest of us have brains. Take a look, for instance, over at The Resistance Journals, where a post hit yesterday called "What is With the Snow From the Recent Storm -- Solar Vortex?" Notwithstanding that I think he means "polar" vortex, in that post we find out that (1) there is no doubt that the government is now controlling the weather, (2) the snow that has fallen doesn't seem to be melting, and (3) people have reported that this snow is flammable. Now, I'm not buying the "flammable" part. Snow is made of frozen water, which is notoriously non-flammable, explaining why water is commonly used to put out fires. And as far as the snow not melting, that may have something to do with the fact that it's cold. Snow does that when it's below 32 F, you know. Then we have this lunatic, over at YouTube, who believes that chemtrails are being used to generate snow to combat global warming, and this has created special snow. He then does an experiment, which you must watch for the humor value alone, wherein he tries to set some snow on fire first with a butane lighter, and then with what appears to be a propane torch. When faced with the blue-hot flame of the propane torch, the snow basically evaporates instantaneously, and the guy is mystified by its disappearance. "Where is the water?" he asks, evidently having forgotten that in third grade we all learned that there is a third state of water besides liquid and solid. "What is this?" he asks. "This ain't snow. This is crazy." Yes, sir, it is that. So the wingnuts are really having a field day with the recent weather. But of course, being a skeptic, I had to run an experiment of my own. You can't just discount something because you're biased to think it is ridiculous; that wouldn't be proper skepticism, right? 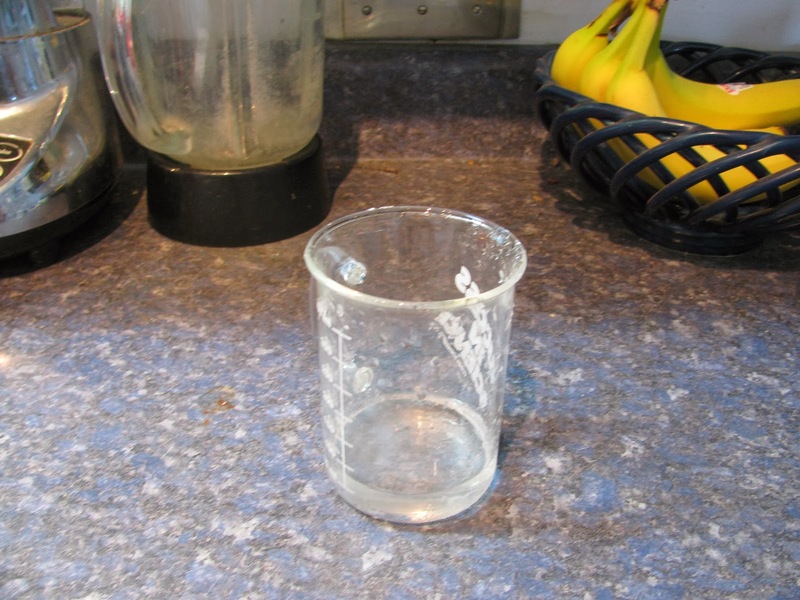 Fortunately, here in upstate New York we are liberally endowed with snow at the moment, so I got a beaker and went out into my front yard and collected some, and brought it inside and put it on my kitchen counter. Fig. 1. 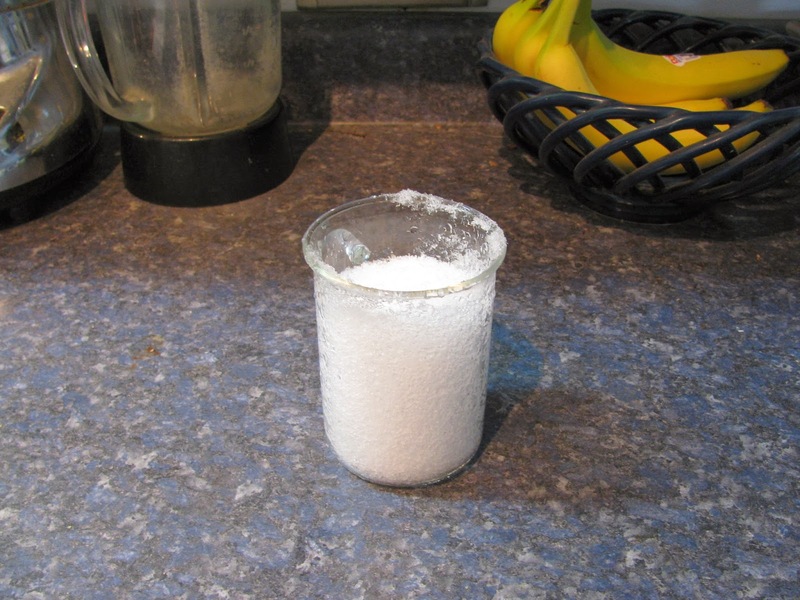 Some snow in a beaker. Yes, I have beakers at home. Don't judge. I attempted to light it with a match, with no success. The match made a sizzling noise and went out, which I believe is the expected behavior. Fig. 2. The same snow after one hour had passed. 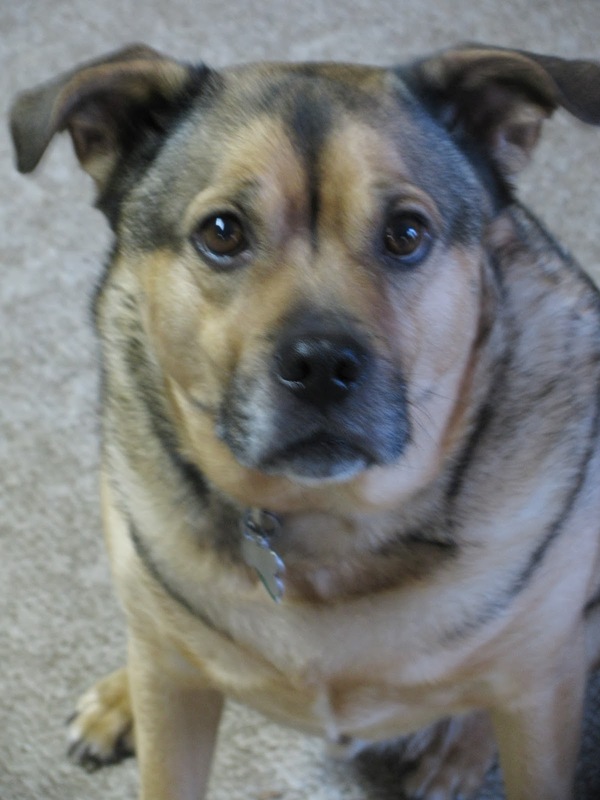 The whole time I was running this experiment, my dog was staring at me in hope, because when I'm rummaging around in the kitchen it usually means food is being prepared, and if food is being prepared, it means he might get some. He did not really understand why I was messing about with beakers and snow and cameras in the kitchen, and no ribeye steaks were being cooked. His general philosophy is, "Why be in the kitchen if no ribeye steaks are involved?" Fig. 3. Grendel looking perplexed. This is a common look for him. So, after running my highly scientific experiment, I have come to the conclusion that (1) the recently fallen snow is not flammable, (2) when it melts, you get plain old water, and (3) none of this has anything to do with "chemtrails." Oh, and (4); if I don't cook ribeye steaks soon, my dog is going to be really disappointed in me. And I'm not even going to address something I saw on Reddit a couple of days ago, which is that the recent snowstorm is all part of a big experiment being run at the Large Hadron Collider at CERN. How on earth an underground particle accelerator could be used to influence the weather on the other side of the freakin' world, I have no idea. So I'll end here, with a wish that wherever you are, you are experiencing clement weather. I don't know about you, but I've had about enough of this polar vortex crapola, even if it isn't being artificially created by the government. Over here in California, we've had the strangest January any of us can remember. Since Christmas, it has been easy to forget that we are supposed to be in the dead of winter. Daytime temps have been in the 60's with nary a cloud in the sky. Which is what is so hilarious. The powers that be, if they were really interested in prosperity for themselves (trickle down), they'd use their weather making machines to neutralize these pressure systems so the grapes in Napa would have a fighting chance. Somehow rich people don't like fruits and vegetables and meat, because if our weather problems are supposedly caused by them, they're shooting themselves in the foot. OK, thank you - it did clear up some of the confusion. I do still have one question, the deal with the burnt spot being soot from the lighter. I didn't use a lighter, I used a lit piece of wood, which does not contain soot forming substances. Please try it with a match or piece of wood, or find a website (preferably a scientific one) where they explain this. For what it's worth, wood forms ash. Trees absorb carbon as part of photosynthesis, and when you bgurn a tree it is this carbon that is released in the form of CO, CO2 and charcoal. Sweet tap-dancing Jesus on a pogo stick. Please do some honest scientific research instead of wasting so much time "debunking" what you personally can't wrap your head around. Also please research the geoengineering (chemtrails) connection with H.A.A.R.P. and the rampant neurodegenerative and autoimmune diseases as well as the "weather changes". This scientist risked his life to expose this on a radio station and apparently paid the ultimate price. Please do not flippantly mock this issue as if it was a "conspiracy THEORY" because our tax dollars are paying for this "theory" (Project Cloverleaf).....it is real. Do research with an open mind like true science demands, instead of only searching for that which supports your pre-determined desired conclusions. You as a science teacher could be leading your students to the truth so they could have the ability to protest this destruction of our environment, our lives, and health! Instead you model ignorance and conformity(shut up and bend over) rather than promoting truth and freedom to resist this dangerous program of weather modification. Science is not supposed to be religious dogma....where heretics who refuse to believe the lies get labeled as "conspiracy theorists". I don't really expect any of this to change your mind, and I doubt you have any real expectation of changing my mind, either. It might be best, at this point, simply to agree to disagree. Watch the links and listen to scientists, Gordon. The one below is best because it is audiovisual not just audio, but either one is one of hundreds of facts from whistleblower scientists exposing the weather modification programs that have gone way too far. Please watch them, Gordon. And look up in the sky......They are spraying everyday even in little old T-Burg. Here's another scientist explaining that the geo engineering is real. He says that anyone seeing this footage and claims this is not real is simply in a state of denial or complete ignorance. If you care about the earth and about people's lives and health, then you need to break free of your conditioned response of labeling the facts as "conspiracy theories". Please Gordon, be part of the solution, not a useful idiot who spews disinformation that only benefits the insane criminals who have the power to do these things.